Houses with Porches are an integral part of Americana. This feature has been a signature attribute of the American home and the center of a family’s social activities almost from the beginning. Very popular in the mid-1800s until the advent of air-conditioning in the mid-1900s, the front porch served as a connection to the outdoors and an essential characteristic of the social activity in the neighborhood. 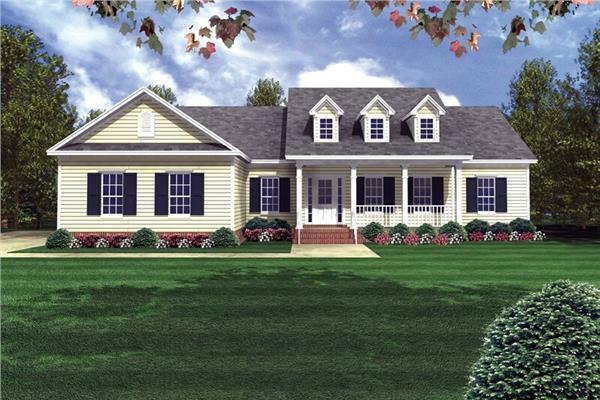 Today, house plans with porches remain very popular. This feature is available on homes of almost any architectural style. Wrap Around Porch: One of the classic design features of many house styles – such as Farmhouse, Southern, Victorian, and Country – the wrap around or two-sided design extends around the home (or at least two sides of it). Wrap around porch house plans are very popular because of the wonderful views they provide and ease of access to the outdoors. They are also great for outdoor entertaining. Front Porch: This style spans the width of the home but does not encircle the entire structure. It’s favored among many homeowners. Small Porch: This style provides a space for outdoor living but also showcases the other attractive features of a home plan, like arched windows and doorways. A small front porch can offer just as much charm. .
Portico: Described as a small covered walkway or porch with a roof supported by columns or piers, the portico goes a long way in enhancing a home's curb appeal. The portico comes in various styles ­– from the classic to the modern. Rear Screened-in Porch: In the 1950s, as Americans wanted more privacy, architects erased the front porch from many floor plan designs and started constructing patios and screened-in spaces. Today, the rear screened-in porch is almost as popular as the front porch. It provides a place to relax and acts as an extension of the home’s entertaining space. If you’re building a new home and your family loves spending time outdoors, consider purchasing a house plan with a porch. Whether you’re looking for a country house plan with a wrap around porch, or a Craftsman style home with a porch on the front and back, you’ll find a wide selection of plans here. Contact our customer support team with any questions.